Beaches, touristy and unexplored, galore along the 600 km Kerala coast. A bunch of them have historical significance too. Kodungalore coast near Kochi had been where St.Thomas, the Apostle of Christ and first missionary in Indian coast, landed. Vasco De Gama, the first European voyager, stranded at Kappad near Calicut heralding the European invasion. Sea has always been an inspiration for Malayali literati and filmmakers. Keep your ears close to the pages of Malayalam novels. You can hear roaring of sea and the poignant life on the coastal Kerala. Ace novelist, late Thakazhi had set, Chemmen, his masterpiece, against the background of sea. Many films have coastal life as background screen. Kerala, with its finest beaches, offers surf and sand unspoilt despite being used by trippers from across the world. Kerala beaches have a character unique. 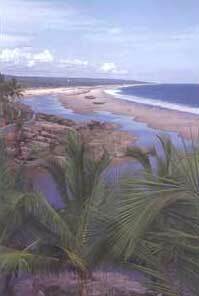 Cool, saline breeze blowing on the coconut groves along the coast would function as a balm to an agitated soul. Lose your heart to the mesmerizing charm of the tropical beaches such as Kovalam, Varkala, Shangumugham, Vizhinjam, Alappuzha, Kappad, Payyambalam and Bekal. At least rumble of a turbulent sea and billowing tidal waves are used as symbols of an agitated mind. A traipse along coastal hamlets will give a whiff of Kerala’s village life. World famous Indian beach since 1930 where foreign and domestic tourists throng. This post-card tropical beach, boarded by blue waters and lush coconut gardens, once was a haunt of hippies from European countries. Kovalam, more popular among backpacking travelers, is a western cultural dot on a traditional and orthodox Kerala physique. "Kovalam" means a grove of coconut trees and true to its name the village offers an endless sight of coconut trees. The crescent-shaped beach has three parts. The southern most beach, and the most popular, is light house beach. It offers an amazing sight of Vizhinjam mosque. The northern Samudra is a laidback one and time, seems, stands still here. The middle, hawah, in the early day, is a beehive of activities with fishermen setting out for sea. With a high rock promontory and a calm bay of blue waters, this beach paradise creates a unique aquarelle on moonlit nights. Azure water and favorable climate make Kovalam a favorite year-round spot for swimming. Sea, here, is pacific and shallow where you can take a dip in the saline waters. Landlubbers will get lifeguards' service. The clean white sandy beach will arouse a temptation irresistible: to lie in idle on the sands and tan the body. Feeling a spent-cartridge after aquatics and beach activities. Get into an Ayurvedic massage centre-there are many such centres- and lie down on the wooden lath for a herbal, body-toning massage. To make the visit memorable, go for a shopping in handicrafts, jewellery and cloth shops spread across the shore. Food and accommodation suiting your purse is available along the beach. A virgin beach, 9 kms south of the renowned Kovalam Beach is the hot spot these days for the traveller. It offers a harmonious combination of nature where you can enjoy lush greeneries, whispering sea breeze and the murmering surf. And it is a "must visit" destinaation having heritage and Ayurvedic resorts like Somatheeram, SuryaSamudra and Manaltheeram. A popular city beach near Thiruvananathapuram airport. On holidays, the city comes out to the beach for a weekly refreshing. Long and wide sandy beach can accommodate tens of thousands. An indoor recreation club, children's park and a star shaped restaurant are some of the facilities at the beach. A large, enticing mermaid sculpture greets visitors. During temple festivals, the beach witnesses ritual washing of temple idols. That the beach is a fishermen village ensures an interesting sight of fishermen having their daily catch. Varkala spa, 42 km away from Thiruvanathapuram, is the best spot along Kerala coast for watching sunset. The sight of the sun melting into the sea would blossom your poetic sense. During monsoon, bellowing waves engulf the beach lying beneath towering cliff and mineral water spring. The mineral water gushing from the hill is believed to have medicinal properties. 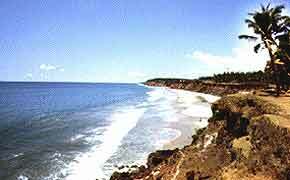 The Varkala sands has become an ideal spot for confluence of cultures exotic and alien. Varkala also houses a leading pilgrim centre in Kerala. The 800-year old Janardhana temple, dedicated to Ayyappan and Hanuman, atop the hill has brought a sobriquet for the region, Southern Kasi (Benares). Non-Hindus are not permitted to enter the inner sanctum but can hang around the temple. Sree Narayana Guru(1855-1928), saint, social reformer, philosopher and leader of Ezhava community, made Varkala his headquarters. Sivagiri mutt, instituted by Sree Narayana Guru, is another major pilgrim centre here. 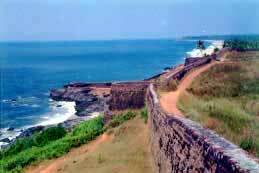 Bekal fort, 14 km away from Kasargode, is the best preserved fort in Kerala. The seashore fort along with its premise is being designed into a major tourist resort. The fort, in its domineering position on a promontory, offers a panoramic view of palm-fringed beaches on both flanks. Shrubby hill slopes down from the fort to rugged rocks before engaging itself with a tête-à-tête with the frothy sea. A sauntering inside the fort would transport to the battle days when rival forces fought for wresting the fort, then a vantage position on Western coast. A Navel academy is nearing completion at Ezhimala, in Kannur near Bakal.